On a dilapidated rural porch, a dark, trilby-sporting figure hunches over a plank of wood. The plank is so worn it could have been pulled from the peeling bannister of the porch it rests on. A wire is looped between two nails, roughly hammered into either end of the plank, and forced taut by an old soda bottle pushed underneath. Next, a copper-wrapped magnet is nailed under the raised string, and flimsily wired to a battered amplifier nearby. As voltage hums through his creation, he slides a length of brass tubing along his single string, and smiles beatifically at the resulting electric scream. Under the gaze of the curious cows in a nearby field, he has built an electric guitar. The now-famous scene in acclaimed guitar documentary It Might Get Loud introduced the casual rock fan to the mesmerising talent and charisma of Jack White. But White had been a musical pioneer long before his powerful demonstration of just how simple the guitar can be. From his early days in Detroit, White had a clear vision for what great music consisted of. Influenced by punk, classic rock, country and traditional American blues music, White gradually refined a sound, a look and a profile that marked him out as unique. 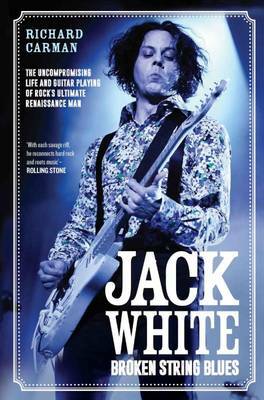 This newly-researched book traces the fascinating life and work of Jack White, as a writer, performer and - most importantly - a guitarist. Whilst The White Stripes were the perfect band for the new millennium - post-modern cool harking back to a time when valves and plastic guitars ruled the world - he has since blended mixed musical styles with great song-writing and blistering technical skill, to become a vital force in keeping the legacy of popular guitar music alive and well. A passionate advocate of analogue technology, a lover of beautiful, classic instruments, and a musical polymath, the former upholsterer has become a guitar hero who spans generations. This is his story.